Shot entirely on location in Big Sur, the film documents the ongoing recovery of the California condor through both the people who are working on the recovery program and the birds themselves. As well as documenting the recovery program itself, the film also explores the birds' social structure and individual interactions. Originally from the UK, Tim has lived in California for over 20 years. An award winning still photographer, he has been branching out into shooting video too. "I moved to Monterey in late 2006 and began to explore the central coast. Over the years I'd lived in California, I'd made a point to try and see native wildlife, and I learned that there was a rare bird down in the Big Sur area I'd never seen, the California condor. After some hunting around on the Internet, I'd gleaned information on where I might see them and ventured down to Big Sur hoping to get lucky. And I did, seeing a few flying high over a nearby ridge. That was Christmas Eve, 2007. Over time and more trips down to Big Sur, I'd see the birds closer and I'd get talking to the Ventana Wildlife Society biologists and interns who were out tracking them. My fascination evolved over the months and years, getting more involved with VWS too, and since late 2012 I've been volunteering with VWS as one of the folks out in Big Sur radio tracking the birds, sending my data into the biologists. Thanks to the tags on the birds, I've gotten some insight into the social dynamics of some of the birds I see more frequently. 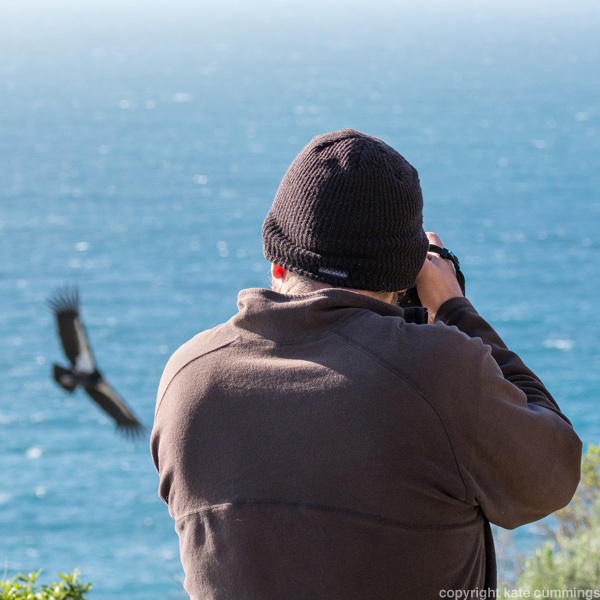 In 2015, I spent over 120 different days down in Big Sur tracking condors, and I placed more of an emphasis on shooting video than stills. When I was lucky enough to come across unusual, unique scenes, I'd shoot lots of video. I was also very lucky in being able to accompany the VWS staff on both nest checks and health checks out in the wilds of Big Sur and at the VWS condor sanctuary high in the hills above the coast in Big Sur. Part way through the year I realized I had enough interesting footage to create a short film about the birds, both their recovery and some of their personalities, and so The California Condors of Big Sur came into being." The film has a running time of 27 minutes and 19 seconds. Video format is 1080p @ 30fps with stereo sound.